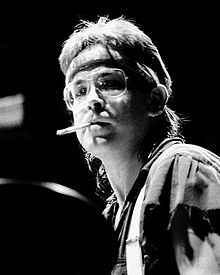 Jeffrey Thomas Porcaro (/pɔːrˈkɑːroʊ/; April 1, 1954 – August 5, 1992) was an American drummer, songwriter, and record producer. In a career that spanned more than 20 years, Porcaro was best known for his work with the rock band Toto. Porcaro is one of the most recorded session musicians in history, working on hundreds of albums and thousands of sessions. While already an established studio player in the 1970s, he came to prominence in the United States as the drummer on the Steely Dan album Katy Lied. AllMusic has characterized him as "arguably the most highly regarded studio drummer in rock from the mid-'70s to the early '90s", further stating that "It is no exaggeration to say that the sound of mainstream pop/rock drumming in the 1980s was, to a large extent, the sound of Jeff Porcaro." He was posthumously inducted into the Modern Drummer Hall of Fame in 1993. Jeffrey Thomas Porcaro was born on April 1, 1954, in Hartford, Connecticut, the eldest son of Los Angeles session percussionist of Italian descent Joe Porcaro and his wife, Eileen. His brothers Mike and Steve were also successful studio musicians and members of the band Toto. Porcaro was raised in the San Fernando Valley area of Los Angeles and attended Ulysses S. Grant High School. On October 22, 1983, Porcaro married Susan Norris, a Los Angeles television broadcaster. Together, they had three sons, Christopher Joseph (1984), Miles Edwin Crawford (1986–2017), and Nico Hendrix (1991). When he was seventeen, Porcaro got his first professional gig playing in Sonny & Cher's touring band. He later called Jim Keltner and Jim Gordon his idols at that time. During his twenties, Porcaro played on hundreds of albums, including several for Steely Dan. He toured with Boz Scaggs before co-founding Toto with his brother Steve and childhood friends Steve Lukather and David Paich. Jeff Porcaro is renowned among drummers for the drum pattern he used on the Grammy Award-winning Toto song "Rosanna", from the album Toto IV. The drum pattern, called the Half-Time Shuffle Groove, was originally created by the legendary drummer Bernard Purdie, who called it the "Purdie Shuffle." Porcaro created his own version of this groove by blending the aforementioned shuffle with John Bonham's groove heard in the Led Zeppelin song "Fool in the Rain". Porcaro describes this groove in detail on a Star Licks video (now DVD) he created shortly after "Rosanna" became popular. Besides his work with Toto, he was also a highly sought-after session musician. Porcaro collaborated with many of the biggest names in music, including George Benson, Larry Carlton, Eric Carmen, Eric Clapton, Joe Cocker, Christopher Cross, Miles Davis, Dire Straits, Donald Fagen, Stan Getz, David Gilmour, James Newton Howard, Al Jarreau, Elton John, Leo Sayer, Rickie Lee Jones, Paul McCartney, Michael McDonald, Sérgio Mendes, Jim Messina, Pink Floyd, Lee Ritenour, Diana Ross, Boz Scaggs, Seals and Crofts, Bruce Springsteen, Steely Dan, Barbra Streisand, Donna Summer and Joe Walsh. Porcaro contributed drums to four tracks on Michael Jackson's Thriller and also played on the Dangerous album hit "Heal the World". He also played on 10cc's ...Meanwhile (1992). On the 1993 10cc Alive album, recorded after his death, the band dedicated "The Night That the Stars Didn't Show" to him. Richard Marx dedicated the song "One Man" to him and said Porcaro was the best drummer he had ever worked with. Michael Jackson made a dedication to Porcaro in the liner notes for his 1995 album HIStory: Past, Present and Future, Book I.
Porcaro died on August 5, 1992, at the age of 38. He had fallen ill after spraying insecticide in the yard of his Hidden Hills home and died that evening at Humana Hospital-West Hills. The coroner's office listed his cause of death to be a heart attack from atherosclerosis (hardening of the arteries). Porcaro's funeral was held on August 10 in the Forest Lawn – Hollywood Hills Cemetery, where he was buried on the Lincoln Terrace, lot 120. The Jeff Porcaro Memorial Fund was established to benefit the music and art departments of Grant High School in Los Angeles, California, where he was a student in the early 1970s. A memorial concert took place at the Universal Amphitheater in Los Angeles on December 14, 1992, with an all-star line-up that included George Harrison, Boz Scaggs, Donald Fagen, Don Henley, Michael McDonald, David Crosby, Eddie Van Halen, and the members of Toto. The proceeds of the concert were used to establish an education trust fund for Porcaro's sons. Porcaro's tombstone was inscribed with the following epitaph, comprising lyrics from Kingdom of Desire track "Wings of Time": "Our love doesn't end here; it lives forever, on the Wings of Time." Porcaro endorsed Pearl drums, pedals, racks and hardware, Paiste cymbals, Remo drumheads and Regaltip drumsticks. He had his own Regaltip Jeff Porcaro signature drumsticks, which are still made by the company in 2019. He used other brands of drums until joining Pearl in 1982, notably Ludwig-Musser, Gretsch, Camco, and Yamaha Drums. Paul McCartney – Give My Regards to Broad Street (1984) - "Silly Love Songs"
^ "Freedrumlessons.com". Freedrumlessons.com. Retrieved 2010-12-09. ^ a b Ruhlmann, William. "Jeff Porcaro". AllMusic. Retrieved 2011-10-24. ^ "JOE PORCARO PERCUSSIONISTA MADE IN ITALY". Il Volo Srl Editore. Retrieved 2016-11-10. ^ "Jeff Porcaro Throwback Thursday from the MI Vault". Musicians Institute. Retrieved 2015-03-13. ^ "Jeff Porcaro's official discography". Toto99.com. Retrieved 2010-12-09. ^ Nate Brown. "Jeff Porcaro – Rosanna Shuffle". OnlineDrummer.com. Archived from the original on September 24, 2015. Retrieved 2015-11-01. ^ "liner notes "Paid vacation", see quote about "One man"". Geocities.jp. Retrieved 2010-12-09. ^ "Official TOTO Website – Band History". Toto99.com. August 5, 1992. Retrieved 2011-10-24. ^ "Jeff Porcaro (1954–1992) – Find A Grave Memorial". Findagrave.com. Retrieved 2015-11-01. ^ "Pearl Drums: Remembering Jeff Porcaro". Pearldrum.com. Retrieved September 29, 2014. ^ "James Newton Howard & Friends". Sheffieldlab.com. Retrieved 2016-06-27. Wikimedia Commons has media related to Jeff Porcaro. Tribute site with complete discography of sessions.